Today’s post is the result of an experiment. It was a calculated risk that I thought would turn out well, and I got kinda lucky. If it had failed, we would have been ordering a pizza. I don’t entirely remember what made me try this, but the basic concept was to extend to entree flavors into the side dish. Not exactly groundbreaking stuff, here. Chefs all over the world tie flavors together to unite a meal, but I wanted to take it a bit further with this meal. 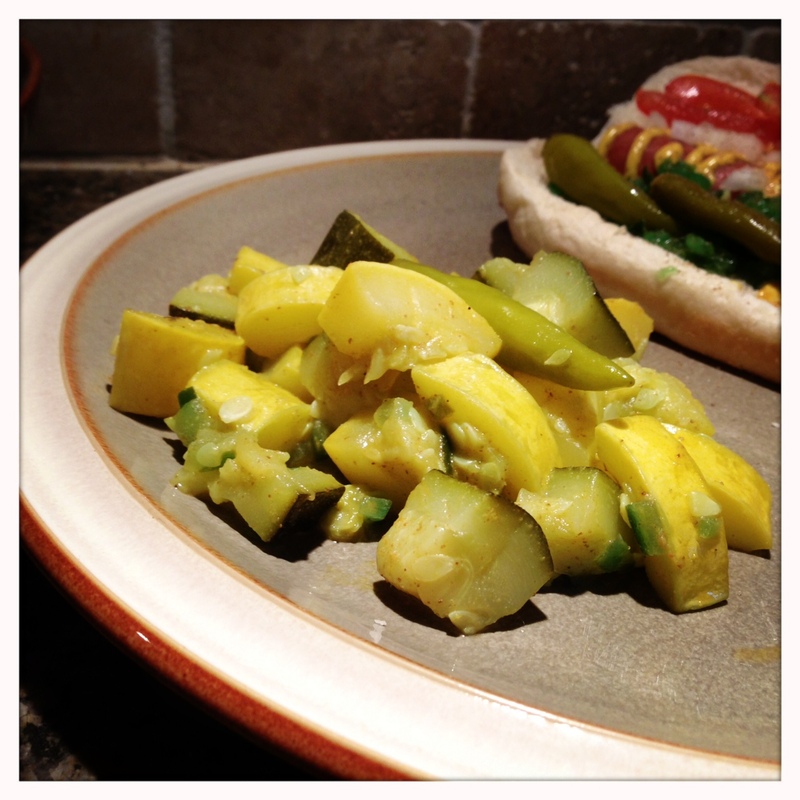 We were having hot dogs for dinner — Chicago style, of course — and we also had some zucchini and yellow squash that needed to be eaten. I don’t know about you, but sauteed zucchini didn’t sound like a spectacular complement to a hot dog. So I decided to use all of the ingredients that go into the magnificent glory that is the Chicago-style hot dog and use them to create a veggie side that was both healthy and fit with the flavors of the meal. 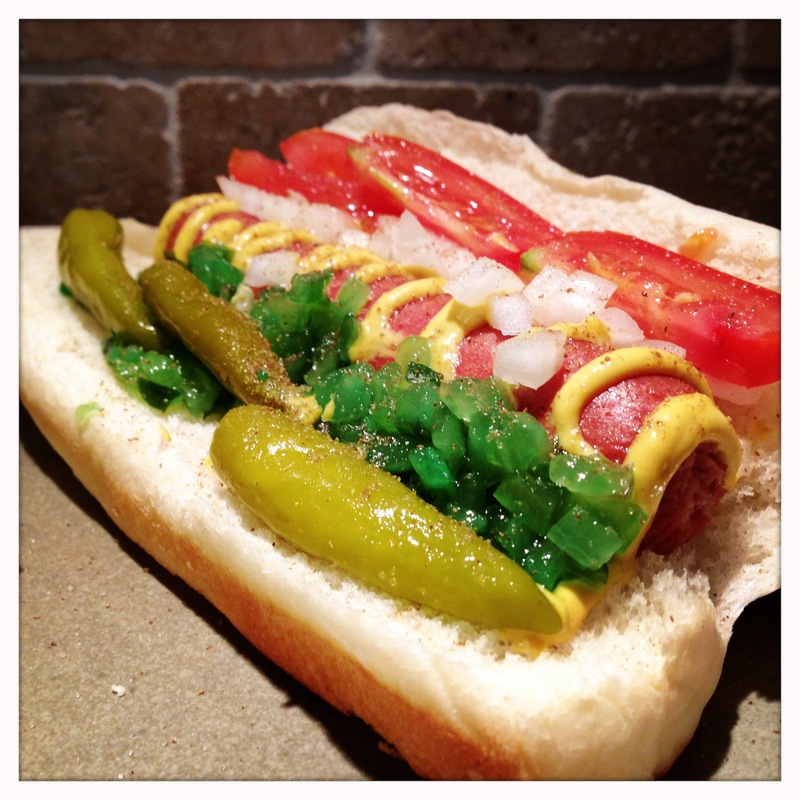 This is not a post about how to make a Chicago-style hot dog. The internwebs have more than adequately covered this topic. If you are making the hot dogs, steam them until they’re thoroughly heated. Place the dog in the bun. Dress the dog with yellow mustard, tomato, diced onion, sweet green relish, a pickle spear (which I did not happen to have this particular day) and a sprinkle of celery salt. No ketchup. Again, not the point of today’s post. So, let’s (finally) get started. 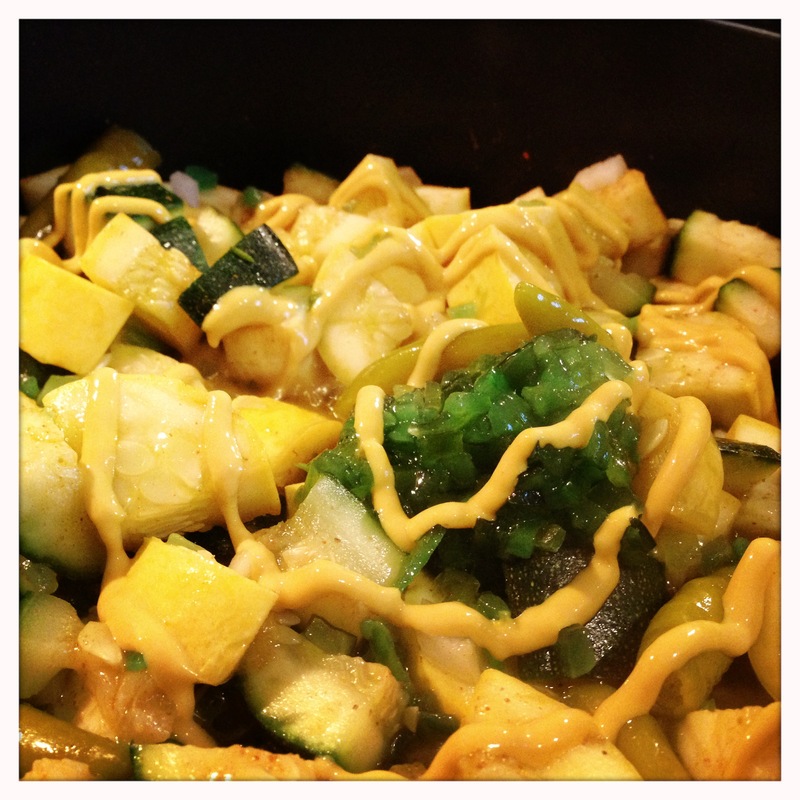 Wash the zucchini and squash. If they’re young and tender, leave the skin on as it will add texture and tastes great. Feel free to peel them if they’re tough or just not your cup of tea, though. 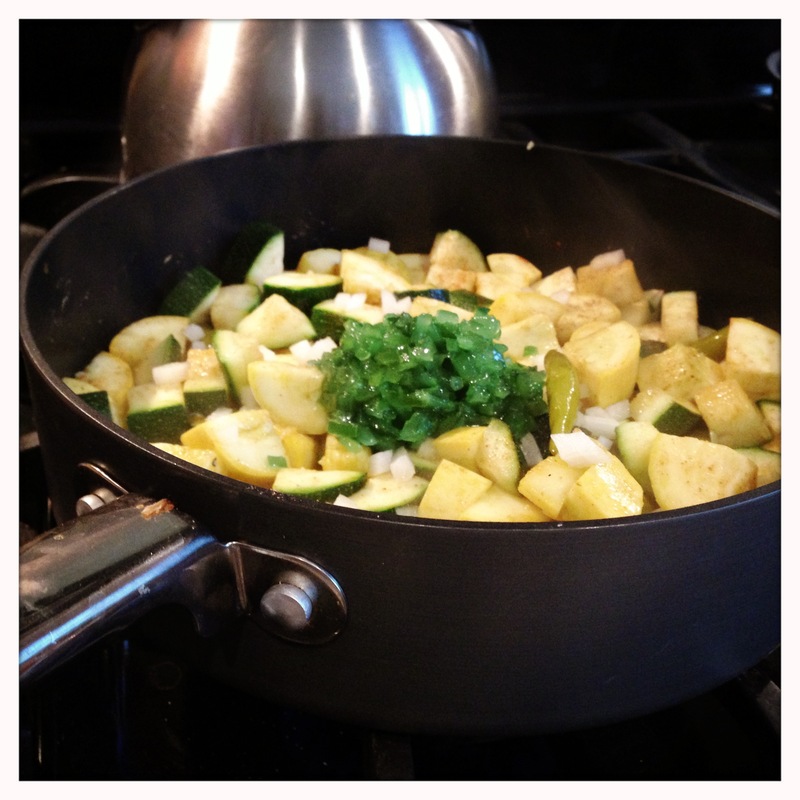 Heat some olive oil in a pan and start to saute the zucchini and squash along with a good handful of diced onion. Season with a little black pepper and celery salt. Once the veggies have started to soften, it’s time to start building the Chicago-dog flavors. Add some of the sweet relish and stir it into the cooking veggies. Add a few (or more) sport peppers to the mix. If you really want to amp up the heat, use some of the brine from the peppers or dice them before adding. If you just want a little of the sport pepper kick, just add one or two whole peppers to the pan and let them flavor the vegetables as they cook. Towards the end of the cooking, drizzle the veggies with yellow mustard. Again, this is to taste. I love mustard, so I squirt liberally. Stir the whole thing several times to coat with the mustard. Taste a piece of zucchini and season accordingly. I ended up seasoning with just a dash of additional celery salt after plating to keep highlight that flavor. Serve it up with a Chicago style dog, or anything you like, and enjoy! Using flavors from a favorite dish can make a great side dish. Using flavors from a “junk food” dish can make veggies more enticing to kids while still being healthy. Trying new things can be scary in the kitchen, but it’s worth it when it pays off.